We understand that architecture generates from the realm of dreams and visions but its final product, buildings, dwell in the reality of the everyday. The architect has the challenge to merge such things as a complex program, a unique lifestyle or a sustainable agenda with the reality of built space and its economical and social consequences. The initial understanding of a client's needs and its translation on to a network of spaces, we believe is the most important phase of a successful project. The poetry of architecture it is not in the building itself, but in the life of its occupants, the role of architecture is merely to express it. A sustainable building is grounded in the reality and life of its user, not in the realm of fantasy and speculation. The relationships and communications between Architect, Client and Builder are essential in controlling the budget while fulfilling the client’s interests. has settled back to Texas. In Austin she received her professional degree from UT, and met Jose. She has worked for the internationally acclaimed Herzog de Meuron, the nationally acclaimed Andersson-Wise and Ford, Powell & Carson. While working at these offices she has been able to work on numerous residential projects as well as several large commercial projects such as the Cottbus Library in Germany, a new link quay in Tenerife (Spain), the McNay museum addition in San Antonio and Austin’s future W-Hotel & ACL studio block development. Laura has also worked as project manager for a local commercial contractor. Now working at Minguell-McQuary she hopes to merge her professional experience with the client’s needs and create elegant spaces to inhabit. A native of Santiago, Chile, holds degrees from Unversidad Catolica de Chile and The University of Texas at Austin. He has worked for MiroRivera Architectcs, Rode+Hurt Architects and David Heymann on a variety from projects ranging from small residential to complex mixed use buildings. 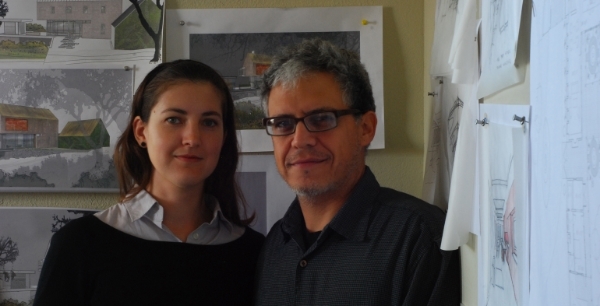 He has also taught at The School of architecture at The University of Texas at Austin. Jose has been finalist on several Architectural and design competitions such as The Texas A&M Bonfire Competition, The International Tree House Competition, DWR Furniture Display show.